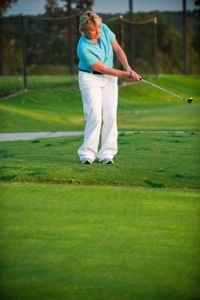 One of the best ways to improve your confidence, score and ball striking is to become a fantastic chipper of the ball. I learned from watching Seve Ballesteros. I had a magical 9- hole playing lesson with him when he was in his prime and I was 18. I was smart enough to not take my eyes off him the whole time, everything he did, I tried to copy. The way he stared at the line, moved his body, walked into the ball, pin pointed his landing, moved his hands through the shots, his rhythm, timing and walk. He was a golf. I’ve tried to copy Seve’s relaxed set-up, less tension but purposeful. 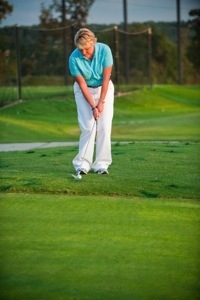 Notice how my feet are narrow & hands low on club, I’m closer to the ball and over my line to target. #2 Use whole body to feel shot ( Similar to QB throwing football). In my takeaway I’m focused on using my body to determine the effort needed for distance. Do not rush, accelerate or try to create separation in transition or downswing. Use your body to swing arms, this takes the ‘Hit’ out. A must for consistency. Do not use right hand or right side of body to produce speed. Use Left side. Pitching the ball is just an extension of chipping. 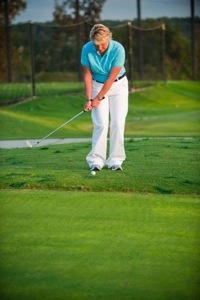 Wider stance, grip up on club a bit more and add a bigger body motion through impact for more aggressive speed. *The skill, just as in any racket, club, bat, motion hitting a ball is to learn how much effort in the swing is needed to impart force to the ball. Distance = Body Turn imparting = speed to club head transferring to ball after impact.